I hope none of you have been eagerly awaiting an update, because I've just realised it has been a VERY long time. In fact the last time I posted on the blog, I was a spring chicken, 29 years young and now I am 30, 30 years old. That's how long it's been, the other morning I pulled 3 grey hairs out of the very top of my head (they're crazy if they think I'm going to believe that ridiculous rumour that if you pull them out, more grow in their place, I doubt it, they've seen what happened to their friends) I would like to say that the grey hairs had nothing to do with the build but I'd probably be telling a lie. It can get a little hard... I know, it's a romantic idea... Building your dream home from the ground up by yourselves, with a while lotta help from your old man and not a huge amount of work by sub contractors. It's easier on the pocket! Absolutely! I've said it before, there is no way we could build this house and live the life we want to live (not slaves to a giganto mortgage) if we weren't doing it this way...and it will be incredibly rewarding in the end. But we go through waves of "holy crap, this is pretty full on", the only weekends we have off are for weddings and surely we'll stop being invited to those soon because we are such bad friends who have to say 'no' to everything because we're "building the house!" So for the last month with everyone being so busy with the silly season in full swing, things have felt a little slow going...I have to remind myself, you're not going to see lightening-speed progress when you really only have 2 days a week to commit to the job. But it's all bout to change, now that we're on holiday - a working holiday. We're not back to work until the 13th of Jan, that's 18 days away which in Waikuku house building time is 9 weekends worth of work!! That's going to make quite the difference. So, it's time to catch you up on what's been happening and where we're at so I can keep you in the loop during this building boot camp we have ahead of us. The whole front of the house is covered in the shadowclad (apart from one tiny patch, which we'll get to soon enough) the cedar has been stained in Cabot's - beach house grey and it's piled up in the corner of one of the rooms just gagging to be put up on that chimney, I can't wait for that day!! You may have noticed the lovely piles of dirt that we have piled up out the front, they're from all the drains that have been dug in....in fact, you should probably know, we now have a toilet... That's a huge deal. There are no real walls around this toilet but it does the same thing and we are happy as can be about it. Below is a shot of the guest bedroom ceiling all done, this happened so quick because I had Guy on hand to help. We had a masterful system down with him cutting and throwing them up to me so I could install them. 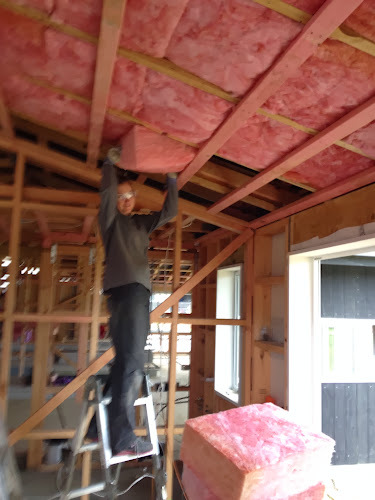 Then it happened, I had to cease working with pink batts because Guy and Dad had to run the rest of the wires through the ceiling, so it was on to the wall insulation. Hooray! I cried...because I had actually been looking forward to it. No more balancing on Papa's old wooden stepladder and climbing through frames...also I have no upper body strength so having my arms in an above your head position for a long amount of time was not easy for me...and best of all, GOODBYE PINKBATTS. 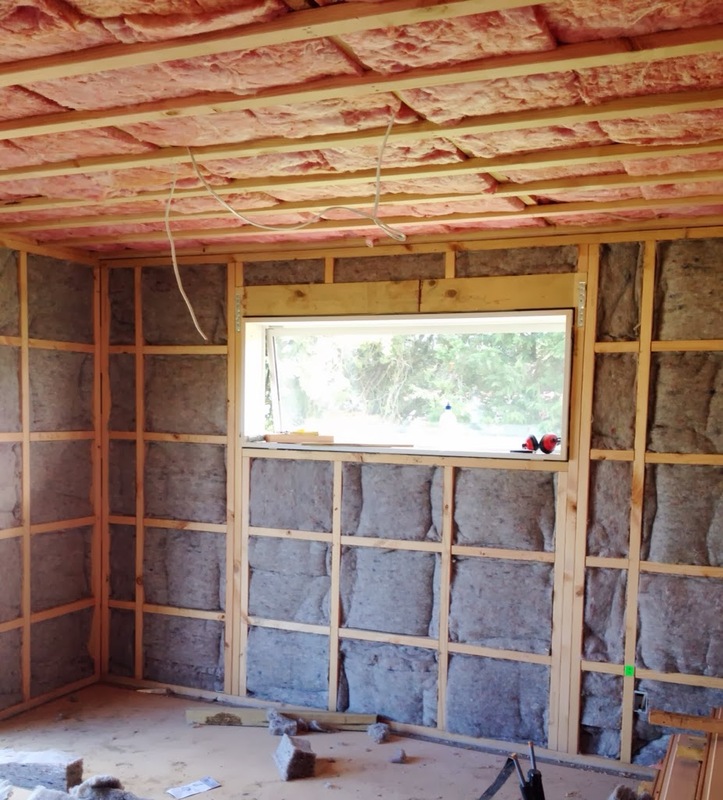 We have chosen Terra Lana natural wool insulation for the walls and what a difference! No protective clothing required, no tiny fibers of glass irritating my skin and to cut them to size you simply tear the wool against the grain. So amazing right! Well not exactly....hahaha! I tricked you. All of the above is wonderful and true but wow, when I started to need to cut the wool to size long ways (many of our studs are closer together than the size we have) which is going with the grain, impossible! Even Fat Max (our grunty craft knife) couldn't do it without a lot of elbow grease and a useless shredded piece of leftover wool. The only thing that works is a pair of old sheep shears. Dad gave them a good 'tickle up' by sharpening them as much as he could. Great for cutting through the wool, and my skin multiple times. I also have a bruised palm BUT I got a whole room done....oh and did I mention once it's installed you have to staple it to the framework. It's pretty time consuming but honestly I actually think it's worth it. Wool is naturally pest and fire retardant and it doesn't shrink or break down over time. By stapling it to the top frame I assume this also prevents any slumping over time. So my end call is, the pros outweigh the cons.....if you access to some shears. 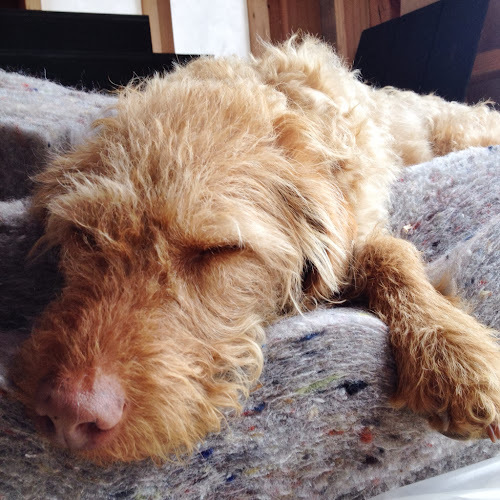 Jed was a huge fan, and he kept the wool warm for me while I was installing. He never tried this with the pink batts funnily enough. We also got our western mound planted and barked and the fence railings put up. We did that to protect the trees as much as we can and get some privacy from a neighboring shed until the plants grow! We're stoked with it, the weeds thought it was great too because they decided to crash the party and grow their little hearts out. Why can't the plants we PLANT grow like weeds! Haha. There you go, that's where we're at... Let's hope by the end of this holiday we've made plenty of progress and I've made plenty of posts. HOPE YOU ALL HAD A FABULOUS CHRISTMAS!!! Every time it rains I think about you and feel bad that you have to put your build on hold! Hopefully you saw enough good weather during your "boot camp" to get a lot accomplished. I love seeing the progress and following along on your little journey. I'm waiting for the stars to align and we have good weather and we both have a free day to meet up. Is it just me or has this summer been a really cold one?? Good luck! Wow, your place is stunning! I'd love to know how you found installing it, staining it etc. We have a tiny weatherboard house and are thinking of recladding it in the shadowclad. Hey Lila, sorry I missed your comment while we were away at a wedding. Oh the shadowclad!!! It was our friend and foe all at the same time. The big plus was its affordability (it saved is 10,000) but it was a long and slow process! 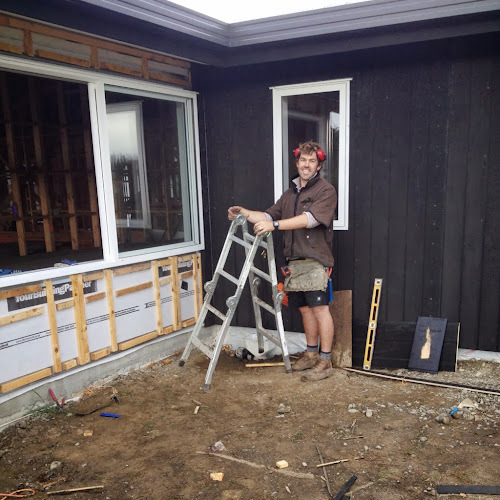 Fine, when you have areas with no windows etc, those parts are awesome but getting it perfect to fit around windows and tight spaces, the measurements have to be so perfect or the whole sheet will be out. I do love the end result though! So, pros and cons I guess. Hope that helps? ?